Nice to have another day off. Ruth and I hung out with Sherman for the morning and just did some cleaning and puttering around. Most of the group had wandered into town, and we did exactly that after lunch. 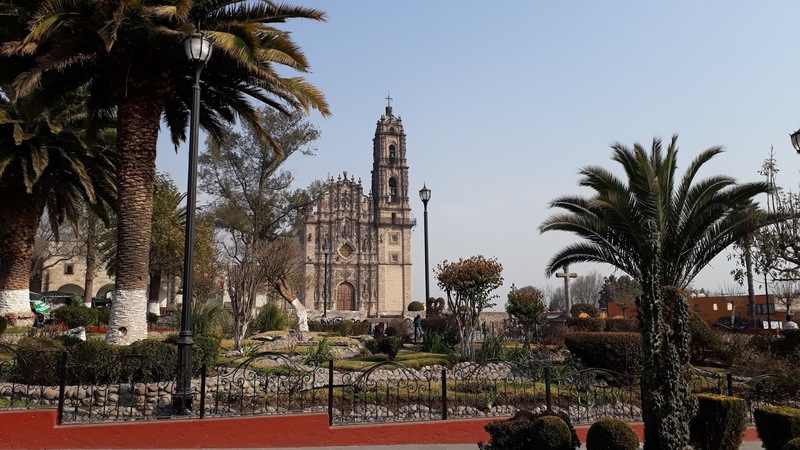 We've never been to Tepotzotlan before, and we had heard that they have a worthwhile church to visit. 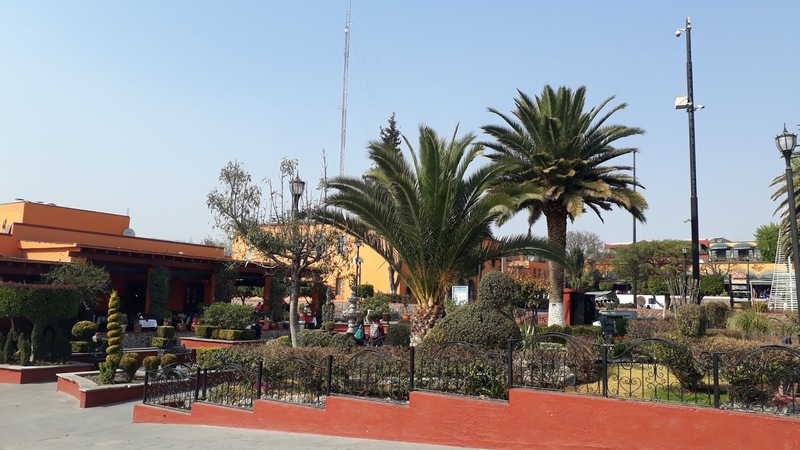 They also have a big Ecological Park on the opposite side of the main highway called Xochitla Parque Ecológico. We had been tempted to walk over there, but we got a bit of a late start and decided to leave it for another time. The front doors of the church were closed, but that is fairly standard sort of between the hours of 2:00pm to 4:00pm so we didn't think anything of it. But we spoke to some of the group later, and they said that you could only enter the church through the museum on the far left side. It was a 70 peso entrance fee, so we decided against it. They all said it was well worth it so maybe we'll do that next time. A pretty central area. Nice for relaxing and watching the world go by. This olive tree forest was nicely shaded, but there were no benches. Strange. We are at about 7,500 feet in altitude here. Sunny, with cloudy breaks but there is a bit of the Mexico City haze (smog) in the air. Temperature is about 20C (68F) during the day and down to about 5C (43F) at night. Quite pleasant. We love La Michoacana paletas. 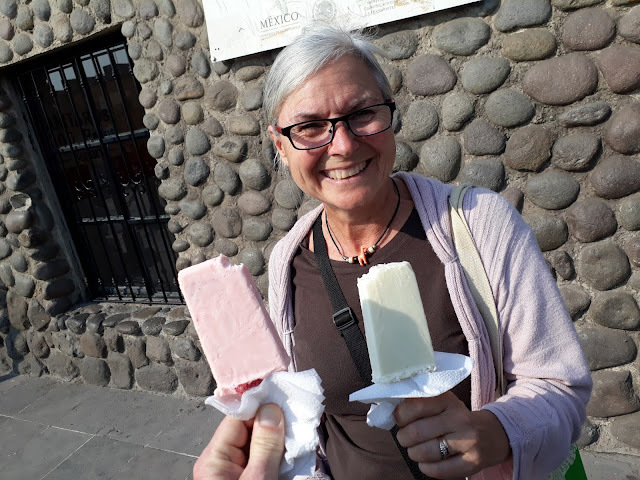 A paleta is a type of ice cream popsicle here in Mexico. There is a franchise here in Mexico called "La Michoacana". Almost every little town has a La Michoacana store. They are the Baskin Robbins of Mexico. We love their paletas. I usually get the strawberry cream one, and Ruth likes the coconut. There are probably 15 or 20 different flavors. Prices vary by location, but yesterday we paid 16 pesos ($1.10 CAD, $0.85 USD) each. 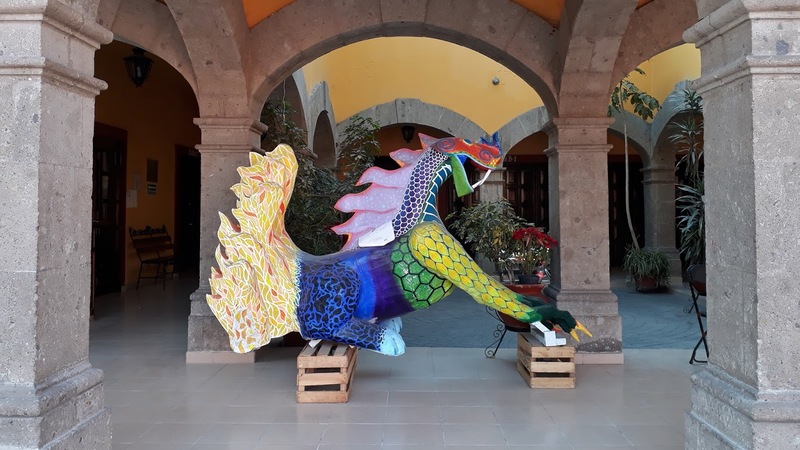 A display outside the Casa de Cultura. 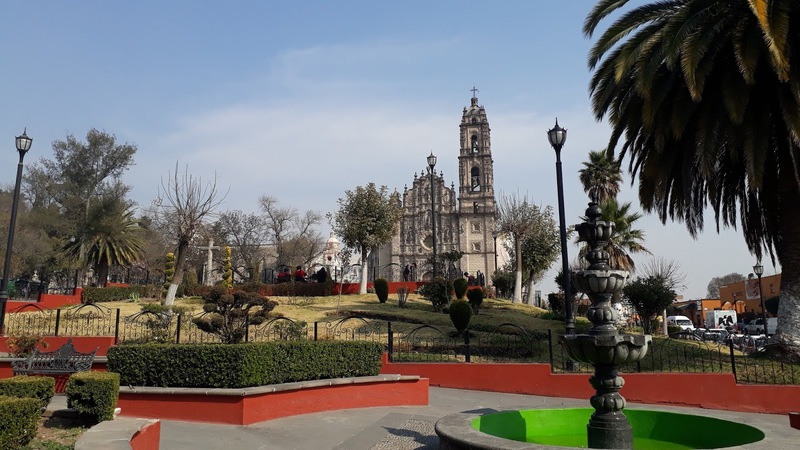 Today, the bus will come at 8:30am and take us into the center of Mexico City. 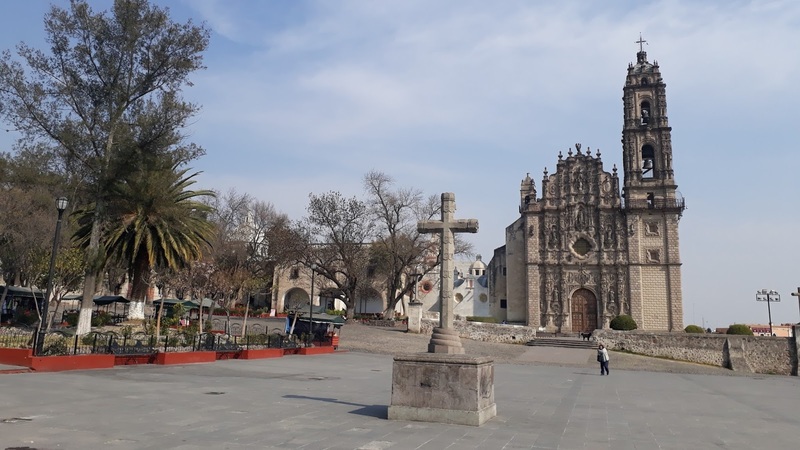 We'll be staying overnight at the popular Hotel Catedral right in the middle of the historic district, only two blocks from the Zocalo. Nice relaxing day, I think those are very much needed to recharge. I personally don't think I could do as much travel as you've been doing. I know you've changed that for another year by reading the comments. I guess it's all what you're used to doing. I find more than 3 travel days in a row is getting to be my limit. The ice cream looked wonderful. Glad you enjoyed your day. Yes, those days are very much needed! Most of our travels days aren't too long and there are normally 2 or 3 non travel days in between but those days are usually booked for tours which is what tends to make it look exhausting. A least with our tour days we aren't doing the driving and can just sit back and relax, talk with your fellow travel mates or just look outside and watch the scenery go by. It is very rare that we have two travel days together, so far only our very first and second day that have been back to back travel days and I don't think we even have 3 travel days scheduled together for the whole trip. The paletas look yummy! We would be trying every flavor!!!!! A pretty looking city. The park would indeed benefit from some benches. Mexico city should be an interesting couple of days. It i very pretty there and apparently the museum there is fantastic, I guess next time we are here we will have to check it out. There are lots of benches about in the area, just not in that particular park which we found odd. 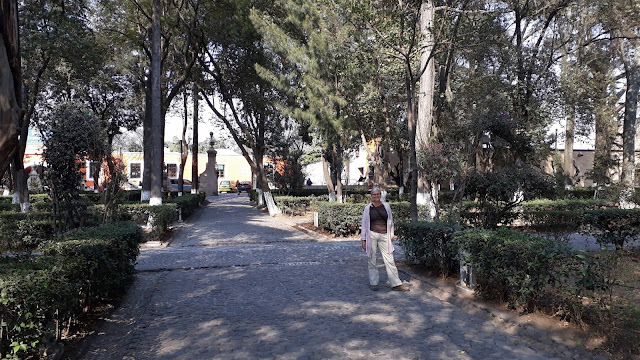 We love visiting Mexico City unfortunately the group really doesn't get a chance to spend very much time walking around and checking out the sights. Hopefully it is enough of a tease to entice then back for another visit on their own. We spent a week here back in March 2012 and we still didn't see all that needed to be seen. I vote for the coconut cream. It is a great stopping off point if you are wanting to visit Mexico City, that is for sure. I’m glad to see I’m not the only one with a three day continuous travel limit! Lol! But we’re still plan to join the group next year and hopefully, the travel days will be less hectic and more rest days booked in. I don't believe that we have any three day continuous travel days booked anywhere on this trip and there are only a couple of times in the whole caravan where there are two days back to back. Most of the stops are at least 2 full days with most being 3 or more. It just looks like lots of travel days because of the tours but when you do a tour you aren't driving, you are able to sit back and relax and let someone else do the driving. Good to know Ruth.....is there somehwere in your blog where you have the itinerary of this trip posted? I can't find the email that Paul Beddows sent with the revised departure from Mission instead of Laredo. Thanks. Send us an email and Kevin can send you the one that we are using at the moment although it will change a little for next year but at least it will give you and idea. Kevin's email address is near the top of the right hand column. Nice picture of Ruth and the paletas!